Chris Brown (L) and Rihanna attend the 55th Annual GRAMMY Awards on February 10, 2013 in Los Angeles, California. You know how every so often, your creepy ex pops up to remind you that you should’ve long ago blocked them on social media? 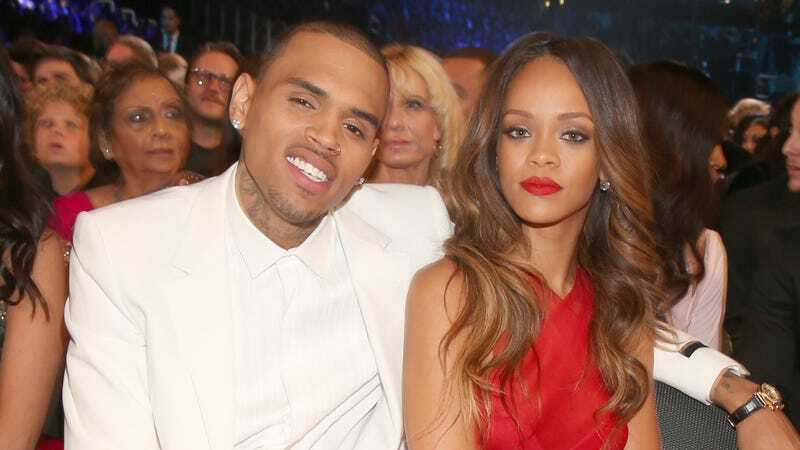 Last weekend, that creepy ex was Chris Brown, who just couldn’t resist letting us all know he’s still checking for Rihanna almost a full decade after he brutally beat her on the eve of the 2009 Grammys. The two briefly reconciled after that altercation and even collaborated on two singles in 2012 but have not been seen together since 2013, much to the relief of Rihanna’s “Navy,” domestic abuse survivors and basically decent people everywhere. So, suffice to say when Brown left “flushed” reactions multiple times in response to two Instagram posts of Rihanna posing in Savage x Fenty lingerie (in promotion of her Black Friday and Cyber Monday sales), many of her followers were not amused. Of course, there were many (misguided) souls who had a decidedly more ... optimistic outlook on the flirty comments, with some defending Brown, and even speculating on yet another reconciliation between the two. Still, others pointed to the fact that when it comes to each other, these two have always done exactly what they wanted—and told the rest of us to stay the hell out of it. As for us? For the record, we have no idea whether Brown and Rihanna have been in touch as of late, but we’ll go on the record as saying we hope not. We’re all for rehabilitation, healing and closure, but considering how Rih has been straight up thriving since parting ways with her abuser, we’d be hard-pressed to cheer for a reunion. She may be over it. We’re still not.